The China respiratory device market is estimated to record a CAGR of approximately 10% during 2018 to 2023 (the forecast period). The China respiratory device market is segmented by diagnostic and monitoring device, by therapeutic device and disposables. The respiratory device market is now shifting to incorporate more ergonomic design features, to simplify the administration process for both patients and medical practitioners. The main aim is to develop innovative devices with higher yield, reduce patient discomfort without complications, and develop better interventional options. Another factor driving innovation is the primary packaging section, which is witnessing stringent safety requirements to prevent internal injuries, leading to the development of new primary packaging systems that are more ergonomic in nature and easier to use. For example, the growth of bacteria on the endotracheal tube may enable it to re-enter the lungs, thus, modifications are developed to prevent bacterial growth, and to reduce the pressure against the tracheal wall. These advances are expected to make the device affordable to for patients, thereby, reducing healthcare costs. All these advances help in catering to the huge demands created by the markets. These technological advancements make the process easier for patients to undergo treatment. Moreover, they provide a major boost in driving the market growth. Additionally, the growth in China’s GDP, over the past couple of decades, has ensured that Chinese citizens have more disposable income than their neighbors. 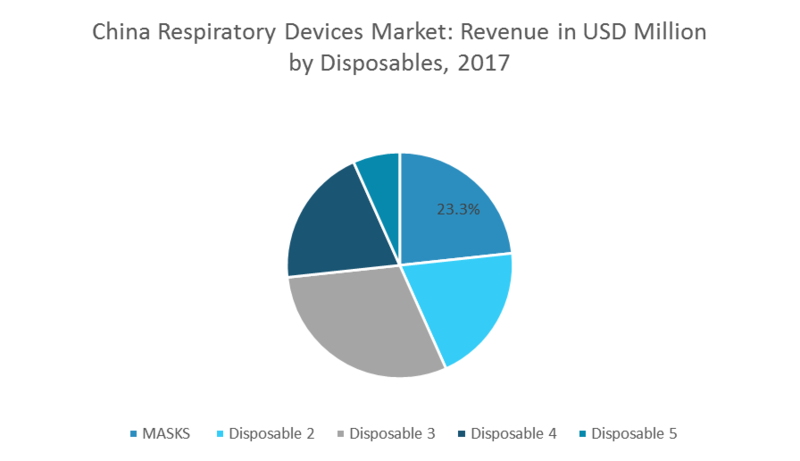 High disposable income translates to better adoption rates for new and emerging technologies in respiratory devices, which is expected to help in the market growth in the region. Developing and under developed countries still have a low per capita income, rendering advanced medical treatments unaffordable. This situation holds true for China, as China still has a high percentage of population concentrated in rural areas. The healthcare facilities in these areas is still in the developing stage, making these technologies inaccessible to the population. Adding more complexity, is the population to doctor ratio. The situation is similar in other lesser economically developed countries. As major products cost high, the procedures tend to be on the expensive side too. This scenario places a major burden on the healthcare system in China, along with the recent increase in additional costs of litigation. Healthcare practitioners need to be aware of both direct and indirect costs, and consider how the implementation of prevention protocols may offer cost savings in the long-term. Masks are the fastest growing category of disposable respiratory devices in the Chinese market. It had a high share of around 23% in the Chinese respiratory device market in 2017, and is at the second position under the disposables category. Decline in ambient air quality and rise in COPD incidences in China will further propel the growth of masks in the Chinese respiratory device market. January 2018: BOMImed announced a partnership with Mindray North America. December 2017: Penlon announced improvements in its Sigma Delta line of vaporizers, to make them compatible with Dräger’s Auto-Exclusion line of products. September 2017: ALung Technologies announced US FDA approval of its Investigational Device Exemption (IDE), to conduct a pivotal clinical trial of the HemoLung Respiratory Assist System for the treatment of adults with severe acute exacerbation of chronic obstructive pulmonary disease (COPD). Major Players: Acutronic Medical Systems, Chart Industries, Alung Technologies, Bomimed, Convatec, Medtronic, Dräger Usa, Fisher & Paykel Healthcare, Ge Healthcare, Intersurgical, Masimo Corporation, Penlon, Philips Healthcare, Resmed, Teleflex, Amongst Others.